A review of “Liquid City,” The Darkened Mirror,” and “Fragile Waters,” a trio of water-related exhibitions at the San Jose Museum of Art, currently on view together through August 6, 2017. As the representative contemporary art institution of Silicon Valley, the San Jose Museum of Art might be expected to engage technology a good bit. They do. Yet growing up in this area — and serving shortly as an arts commissioner for the city — I always understood the bigger strength of this museum to be in its responsiveness to the issues facing the diverse denizens of the region. From immigration and borders and local migrant culture, to race and religion and suburban sprawl, SJMA has done an amenable job of serving its community through art. In these rooms are some of the most powerful and emotive landscapes you might ever come across. This season, water and urbanism are the featured fare, and it couldn’t have come at a more relevant time. The period from 2011–2014 was the driest on record in California, sending the largely agricultural state into a panic. This year, the drought subsided and the clouds returned in fierce form, dumping enough water onto the region to mark the wettest year on record. The rains triggered a state of emergency complete with collapsed roads, broken dams, and severe flooding. The floods that ravaged Silicon Valley this winter may have dried up, but there is still plenty of water flowing through the San Jose Museum of Art. 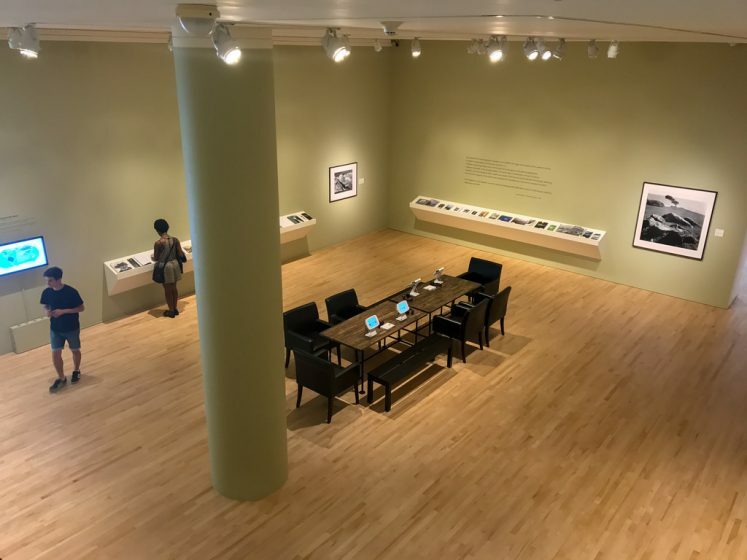 Luckily, it’s not the actual wet stuff, but instead comes in the form of silver gelatin prints, etchings, digital films, and sculptures that comprise three complimentary exhibitions currently on view. Diana Al-Hadid, “Nolli’s Orders,” 2012. Steel, polymer gypsum, fiberglass, wood, foam, plaster, aluminum foil, and pigment. 156 × 264 × 228 inches. Courtesy of the artist and Marianne Boesky Gallery. 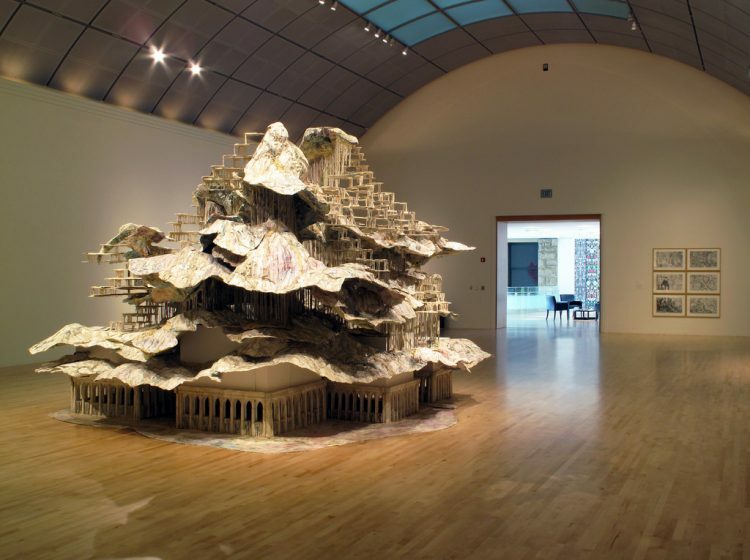 Installation view, San Jose Museum of Art. In the central skylight gallery is the Liquid City exhibition. Sparse in content, this exhibition is dominated by Diana Al-Hadid’s massive flowing sculpture, titled Nolli’s Orders. The museum’s curator, Lauren Schell Dickens, raises her eyebrows and gives a sly triumphant grin as she tells me that the piece arrived in 70 some odd boxes on two freight trucks, taking a crew of five the better part of a week to assemble. Although there are remarkable works throughout the museum right now, it is Nolli’s Orders that provides the gravity here. Lauren tells me she sees the sculpture functioning as a fountain and community meeting place in the tradition of Bernini’s fountain in the Piazzo Novona and the other great public fountains of Italy. Fountain is a good metaphor for this, a flowing, dripping sculpture that intertwines human form with architectural and natural features. Nolli’s Orders bends, twists, and knocks off kilter our established ideas of social order and the built city. The ability of my words to convey experience easily finds its limit in trying to talk of this sculpture. But a certain writer, Italo Calvino, does come to mind. A bit sheepishly, I tell Lauren that Nolli’s Orders feels like a physical manifestation of Calvino’s fantastical and expressive writings. Especially, in the book Invisible Cities — a book which was glowingly recommended in a recent TNOC reading list. “That’s profound,” says Lauren “this very sculpture was originally commissioned for an exhibition based on Invisible Cities.” The relationship to Calvino’s writing only deepens as we continue walking around the piece. Moving toward the half-way point on our 360-degree trip around the sculpture, the perfectly weighted facade begins to give way. Suddenly, figures are awkwardly contorted, space floats. The sculpture seems to “unmoor” itself, in Lauren’s words. By the time you reach the rear of Nolli’s Orders, you feel as though you’ve ventured into an off-limits underbelly. Here you find that the solid-looking figures that presented themselves to you upon your entrance to the space are, in reality, all hollow shells. Lauren explains this a purposeful nod by Al-Hadid — who lives in the United States, but was born in the Syrian city of Aleppo — to issues of society and identity. In context of America’s current relationship with places like Syria, the sculpture reads radically differently. Sitting with it for a while, you might discover multiple socially and environmentally relevant references flowing through these sculptural forms, all twisted just as freely as the physical perspectives are. Or perhaps you’ll just see a warped, ethereal city. Across the foyer from Liquid City is The Darkened Mirror: Global Perspectives on Water, a collection of mostly video-based works from international artists. 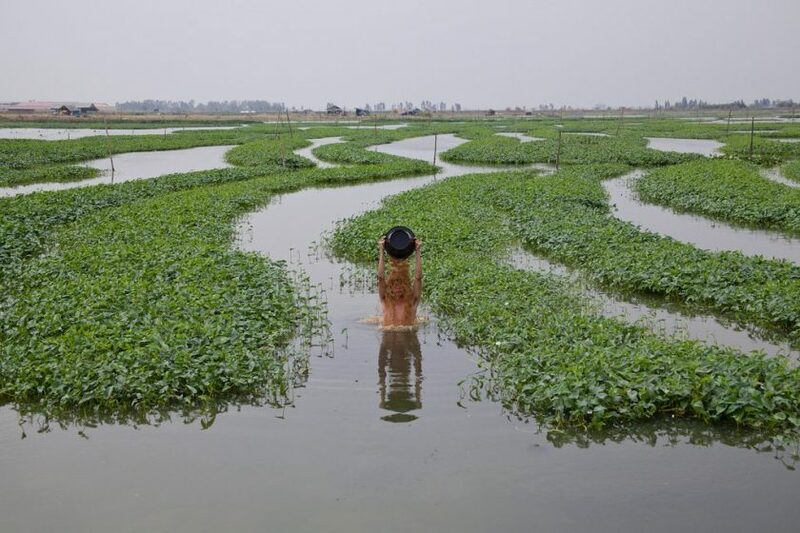 Somewhat of a tonic to Al-Hadid’s oracular work, these pieces each focus on very specific issues: water pollution in India, destruction of lakes and water ecosystems during urban development in Cambodia, and hypnotic imagery of industrial agriculture in the United States. Khvay Samnang, Untitled, 2011. Digital still from video. Image courtesy of the artist and SA SA BASSAC. Hidden in the back of this part of the exhibition and barely mentioned in the catalog is a film called Llano, a cinematic tour that is at once absurd, humorous, and unflinchingly critical. In it, Danish film-based artist Jesper Just brings us into the abandoned town of Llano del Rio, a utopian commune that launched in 1914 in the desert just northeast of Los Angeles. Not surprisingly, the community, which was home to 1,000 people, failed just four years after its founding, mainly due to lack of water. Just’s film takes us through scenes of a woman fruitlessly trying to rebuild the structure of the commune, block by block, as the structure relentlessly deteriorates right before our eyes on account of water pouring down on it. A nod to the artist’s cinematic background, the rain comes courtesy of what Lauren calls a “Hollywood style rain machine” that the artist brought in for filming. The work had me laughing. Albeit, at the inevitable destruction of the material-based society which I am so tethered to. It’s good to be able to laugh at yourself, your country, your aspirations. Isn’t it? Well, an artist named Just apparently thinks so. 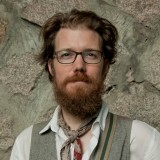 His work seems often to aim at, and hit, this mark. 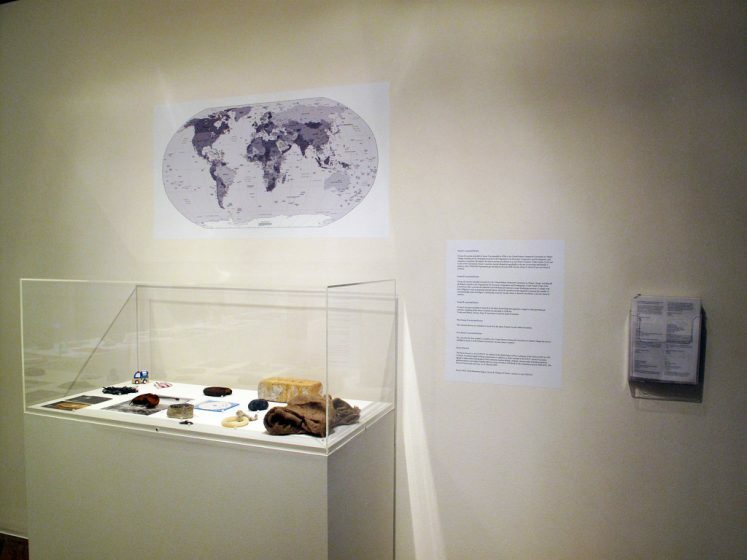 Installation view of Amy Balkin et al., “A People’s Archive of Sinking and Melting,” 2012 – ongoing, as installed in “The Darkened Mirror: Global Perspectives on Water” at San Jose Museum of Art. Attached to this video-based exhibit is also a tactile work, this one by a San Francisco Bay Area artist, Amy Balkin, titled Sinking and Melting. The work invites visitors to contribute items related to climate change, along with stories about the items. All of this is cataloged and presented as if it were in an old-school history museum, yet Silicon Valley still gets a foot into this one nevertheless; the entire work also exists a digitized version of the exhibition on the artist’s Tumblr. This side of the museum is full of irony. Reading room for the “Fragile Waters” exhibition at San Jose Museum of Art. Image courtesy of the museum. Leaving these works, we walk downstairs to what some might call the blockbuster of the museum’s current offerings. The Fragile Waters exhibition fills the entirety of the main floor gallery spaces with one hundred and seventeen large scale black and white photographic prints by seminal nature photographer Ansel Adams, along with the works of contemporaries Earnest H. Brooks II and Dorothy Kerper Monnelly. The exhibition also includes an extensive reading room. Whereas the other two exhibitions here approach water and the environment from a wide societal view — making various connections between human habits and the rest of nature — the images on display downstairs are decidedly focused on the beauty of what we humans like to call ‘pristine’ nature. Stepping in front of these images, you are asked to forget that there is a road just behind Adams’ giant 8×10 view-camera, or that boats carve fluid channels just beyond the reach of Brooks’ lens. The images are here to remind us of what is possible, of what exists outside the walls of our offices, of the grand and unbelievable treasures that nature consistently builds. Indeed, in these rooms are some of the most powerful and emotive landscapes you might ever come across. In the case of Adams’ work in particular, these are images which literally changed the course of nature conservation and national policy nearly a century ago, popularizing the appreciation of nature for nature’s sake, and inspiring a nation and its leaders to save these treasures for future generations. Lest we think that the job of these images is over, one only has to take a look at the current precarious situation regarding national parks under the current United States administration. Public knowledge and the building of support for nature is, in the end, what drives public policy. Adams knew that well, and his images still carry a salient message today. Still, the world has changed much since Ansel Adams took his stand and conveyed his love of nature through images. As a collection, these images can only tell a small piece of the story that desperately needs to be told today. The success of the work on display here at San Jose Museum of Art, and for that matter its power to change us, lies not in any one work, but rather in this carefully-programmed trio of exhibitions. The curatorial staff deserves much credit here and I suggest, if you do get the chance to see this extraordinary gathering of work, to give yourself ample time to experience it all. Good thing for you that all of this is on view together in San Jose, California until 6 August 2017. After that point, the photographs come down. The other two exhibitions mentioned, Darkened Mirror and Liquid City are on display until 27 August, and 24 September, respectively.